Received June 16, 2018; Revised August 17, 2018; Accepted August 17, 2018. Rice is being consumed in over 50% of the world’s population, and it is main food in Korea. Many accessions of rice have been utilized for breeding purposes such as the use for functional food, disease resistance, improved quality and yield. In this study, the 1000-grain weight, one of important components for yield in rice, was investigated and analyzed by conducting a genome-wide association study (GWAS) using whole genome SNP genotype data on 295 Korean rice core sets. Four genes, Os01g0315700, Os03g0604566, Os04g0413500 and Os05g0216950, are significantly associated with 1000-grain weight. We presume carefully that the function of these kind genes will help in the selection of intermediate parents with high yield and genetic markers to develop new varieties. Rice, one of the three major crops in the world, is consumed by more than 50% of the world’s population, and it is mainly cultivated in Asia. It is rich in minerals and vitamins, and it has high nutritional value. In the 1970s, when the so-called “period of spring poverty” food scarcity occurred, Korea increased its food self-sufficiency by developing and cultivating the high-yield ‘Tongilbyeo’ variety (Chung and Heu 1980). The rice yield per unit area is determined by considering agronomic characteristics such as panicle number per hill, number of spikelets per panicle, ripened grain and 1000-grain weight. A number of factors affect yield as follows: variety, weather, soil conditions and crop managements. The 1000-grain weight of the rice seed, among the yield components, is the least affected by the environment. But the panicle number per hill and number of spikelets per panicle are influenced greatly by environmental factors, such as air temperature and water management (Doganlar et al. 2000; Kim et al. 2016a). The length, width and thickness of seeds determining the 1000-grain weight of rice are related to each other, and are highly inherited (Tae 2003; Fan et al. 2006; Weng et al. 2008). According to the source-sink theory of photosynthetic products, rice plants produce and accumulate anabolic products through photosynthesis in leaves and stems. The anabolic products affect the weight of seeds and ultimately determine the yield of rice (Lee et al. 2009). The length, width, and thickness of seeds that determine the 1,000-grain weight of rice are very closely related to each other and are highly inherited. For this reason, quantitative trait loci (QTL) analysis of 1,000-grain weight has been performed to date. The gw gene (Xiao et al. 1995) and the tgw gene (Ishimaru 2003) were found to affect the 1000-grain weight of rice. It was revealed that among the 11 genes involved in seed formation, GW2, qGT4, and qGL6 genes affect the heading stage of rice (Shim et al. 2016). Cho et al. (2007) revealed the tgw gene on chromosomes 1, 2, 4, 5, 6, 8, 10 and 12 through the identification of quantitative trait loci in rice for yield, yield components, and agronomic traits across years and locations. Ishimaru (2003) identified the tgw6 gene on chromosome 6, and Xiao et al. (1995) reported seven genes including gw3, gw4 and gw5 on chromosome 3, 4, 5, 7 and 8. Shan et al. (2009) reported that the spd6 gene affects seed weight and number of spikelets per panicle using Os06g04810, Os06g04820, Os06g04830 and Os06g04840 through the nearly isogenic line (NIL) population. QTL analysis using SSR and RFLP molecular markers is widely used to find gene related specific trait (Wu et al. 2013), but in general, there are various limitation in the mapping of specific alleles isolated from the recombination inbred line (RIL) population (Korte and Farlow 2013). Recently, genome-wide association study (GWAS) is widely used to find correlations between single nucleotide polymorphisms (SNPs) and traits of various genetic resources. GWAS can use genomic reanalysis data to find the association between more than a million SNPs and phenotypes, and it has the advantage of being able to simultaneously screen various and complex genetic variation on numerous genetic resources (Zhao et al. 2011b; Koh et al. 2015). To date, GWAS has contributed to the identification of 14 genes related to agricultural traits including heading stage and seed width (Huang et al. 2010), OsSPL13 genes related to seed size of rice (Huang et al. 2010; Si et al. 2015). Also, It is known that GS3 and qSW5 are found at 22 positions related to grain yield components including 667,379 bp in chromosome 1 and 16,939,138 bp in chromosome 3 (Feng et al. 2016). The genes affecting 1000-grain weight of rice could be figured out from many previous studies. However, the GWAS studies focused on 1000-grain weight has not been conducted intensively (Yang et al. 2014; Chen et al. 2016; Feng et al. 2016). In this study, we have identified the SNPs located in exon regions of candidate genes for the 1000-grain weight of rice. SNPs were classified into non-synonymous SNPs affecting the amino acid sequence and synonymous SNPs without affecting the genetic variation. A total of 295 rice accessions were divided into 137 heuristic-set (HS) and 158 Korean-bred line (KB). And both GWAS and haplotype analysis were used to identify 4 new candidate genes (Os01g0315700, Os03g0604566, Os04g0413500 and Os05g0216950), which seem to be associated with 1000-grain weight. We cultivated 295 accessions of rice at the Kongju National University experimental farm. The 295 accessions consisted of 137 HS accessions based on PowerCore algorithm (Kim et al. 2007) and 158 KB accessions. The genomic DNA was extracted from frozen leaves at −72°C using DNeasy Plant Kit (QIAGEN), and The following analysis was carried only when the concentration of genomic-DNA was over at least 30 ng/uL. DNA QC (Quality Control) was measured by Qubit machine (Invitrogen) and UV absorbance using Nanodrop (Tecan F200). Genomic re-sequencing was performed through library construction, and the short-read sequence was produced with HiSeq 2500 (Illumina). To analyze the genetic characteristics of the whole accession, a single nucleotide variants (SNV) was called from the whole genome resequencing data generated by Kongju National University (Kim et al. 2016b; Lee et al. 2016). High-quality reads were aligned to the reference japonica rice genome assembly (IRGSP-1.0, International Rice Genome Sequence Project). SNP was called from the aligned reads and joint genotyping on multiple accessions, and the quality control were performed by using SAM tools (version 1.3) and GATK (version 3.6). The selected seeds of rice were cultivated with one by one seedling per hill in the experimental field of Kongju National University. The 1000-grain weight was measured in three replicates. An association between SNPs and 1000-grain weight was determined by GWAS. It was estimated the P-value of each SNP site with the significant effect of the SNP to the trait, and visualized by −log10 (P) in the Manhattan plot (Koh et al. 2015). GAPIT, a genome association and prediction integrated tool, was used for GWAS (Lipka et al. 2012). The identification of candidate genes within ± 10 Kbp from the significant SNP was referred to RAP-DB (rapdb.dna.affrc.go.jp). For the haplotype analysis, ‘Nipponbare’ was used as reference variety (IRGSP 2005). ANOVA test and Duncan’s multiple range tests (DMRT) were performed using SAS (statistical analysis system, ver. 9.0) to confirm the phenotypic differences among the haplotype groups. The genetic reanalysis of 295 accessions of selection resources resulted in 42,414,594 sequence readings, 96.4% mapping rate, and 9.83X average depth. The total number of SNPs in the core set was 11,632,676. The number of insertio /deletion (InDels) was 1,285,506. The results were further subdivided into two subpopulations: the HS accessions and the KB accessions. The number of SNPs in HS was 11,032,184 and its InDels was 1,198,144. For KB, the number of SNPs was 8,565,179 and its InDels was 999,782 (Table 1). The average 1000-grain weight of 295 accessions was 26.67 g, ranging from 13.37 g to 43.03 g. It is similar to data of the Rural Development Administration (RDA)-gene bank information center. The average 1000-grain weight of KB accessions was 27.81 g, which was higher than the 25.36 g of HS accessions. The whole accessions consisting of introduced, landrace, weedy and cultivated species. The results show that the average for cultivated species was 27.71 g, which was the highest among the other species. It was followed by introduced 26.51 g, landrace 24.82 g and weedy 23.07 g (Table 2). F-statistical analysis was performed based on the null hypothesis that there is no correlation between SNP and trait. The P-values were plotted with Manhattan style (Table 3, Figs. 1, 2 and 3). The GWAS result from the whole 295 accessions showed four peak regions, where the SNPs with very low P-values under 1.0 × 10 −5 were clustered together. The minimum P-value of SNPs for the regions were 8.32 × 10 −8 at 18,822,800bp in chromosome 9, followed by 2.29 × 10 −6, 2.34 × 10 −6 and 5.37 × 10 −6 in chromosome 11, 3 and 1 respectively (Fig. 1). For the HS accessions, there were four peak regions in the Manhattan plot. The minimum P-value of the regions was 6.76 × 10 −6 in chromosome 9, followed by 1.91 × 10 −5, 4.68 × 10 −5 and 7.24 × 10 −5 in chromosome 1, 7 and 11 respectively. In the case of the KB accessions, three clustered peak regions were identified in the Manhattan plot, where the lowest P-value was 8.13 × 10 −6 in chromosome 4, followed by 1.32 × 10 −5 and 2.51 × 10 −5 in chromosome 5 and 7 respectively (Fig. 3). The cut off P-values for rejection of null hypothesis were determined by referring to two previous studies (Wang et al. 2015; Kim et al. 2016b). It was similar to P-values of those studies (Wang et al. 2015; Kim et al. 2016b). The candidate genes were identified in RAP-DB (rapdb.dna.affrc.go.jp) within ± 10 Kbp based on the selected SNP position (Table 4). The candidate genes, which were considered to be highly related to the 1000-grain weight of the 295 accessions, were Os01g0315700 (similar to monoglyceride lipase), Os03g0604566 (conserved hypothetical protein), Os03g0604700 (hypothetical protein), Os09g0488000 (Acyl-CoA N-acyltransferase domain containing protein) and Os11g0648700 (protein of unknown function DUF3615 domain containing protein) (Fig. 1). In the HS accessions, three candidate genes, Os01g0342800 (similar to UPF0631 protein), Os01g0342900 (similar to Adenosine monophosphate binding protein 1 AMPBP1) and Os01g0343001 (hypothetical gene), were identified in chromosome 1. In chromosome 9, Os09g0488000 (Acyl-CoA N-acyltransferase domain containing protein) was confirmed. Both Os07g0211900 (protein of unknown function DUF632 domain containing protein) and Os11g0648700 (protein of unknown function DUF3615 domain containing protein) were confirmed to be in chromosome 7 and 11, respectively (Fig. 2). The candidate genes identified in the KB accessions were Os04g0420500 (hypothetical protein), Os04g0420600 (similar to H0525E10.2 protein), Os05g0216950 (NB-ARC domain containing protein) and Os07g0524100 (Thioredoxin domain 2 containing protein) (Fig. 3). Based on the results of GWAS analysis for the whole 295 accessions, it was compared with haplotype analysis and phenotypic data of the exon regions of candidate genes. The haplotype analysis of five selected candidate genes showed that non-synonymous SNPs in the exon region were Os03g0604566, Os03g0604700, OS09g0488000 and Os11g0648700. The candidate gene Os01g0315700 showed a non-synonymous SNP at position 11,906,626 and a synonymous SNP at positions 11,906,645 and 11,906,654. Also, Os03g0604700 (Hap1 and Hap2), Os09g0488000 (Hap1, Hap2, and Hap3) and Os11g0648700 (Hap1, Hap2, Hap3, and Hap4) have non-synonymous SNPs, but there is no statistical significance. The candidate genes showing statistical significance were Os01g0315700 and Os03g0604566. The candidate gene Os01g0315700 was involved in two groups (Hap1 and Hap2), and the average 1000-grain weight was 27.12 g for Hap1, 25.51 g for Hap2 respectively (Fig. 4A). Also, the candidate gene Os03g0604566 was involved in two groups (Hap1 and Hap2), and the average 1000-grain weights were 26.93 g for Hap1, 25.49 g for Hap2 respectively (Fig. 4B). Haplotype analysis of six candidate genes selected from the HS of 137 accessions identified Os01g0342800 (Hap1 and Hap2), Os01g0342900 (Hap1, Hap2, Hap3, and Hap4), Os01g0343001 (Hap1, Hap2, Hap3, Hap4, Hap5, and Hap6), Os07g0211900 (Hap1, Hap2, and Hap3), Os09g0488000 (Hap1, Hap2, and Hap3) and Os11g0648700 (Hap1, Hap2, Hap3, and Hap4). All of them are non-synonymous SNPs in the exon portion, but there is no statistical significance. Haplotype analysis of four candidate genes selected from the 158 accessions of the KB was also conducted. 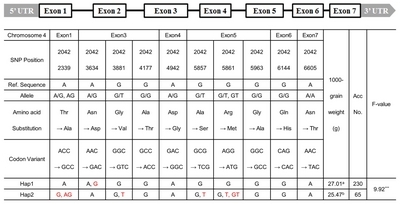 The candidate genes showing non-synonymous SNP in the exon region were Os04g0420500, Os04g0420600 and Os05g0216950. The candidate gene Os07g0524100 showed both non-synonymous SNP and synonymous SNP. However, Os04g0420500 (Hap1 and Hap2), Os04g0420600 (Hap1 and Hap2) and Os07g0524100 (Hap1 and Hap2) were divided into groups, but no significant difference was observed. The candidate gene, Os05g0216950 showing statistical significance, was divided into four groups (Hap1, Hap2, Hap3 and Hap4). The average 1000-grain weight of group is Hap1 27.78 g, Hap2 32.07 g, Hap3 26.19 g and Hap4 30.02 g respectively (Fig. 5). As the result of GWAS analysis, no gene was found to be directly related to the 1000-grain weight in the range of ± 10 Kbp. However, according to the haplotype analysis of the candidate gene, Os04g0413500 has non-synonymous SNPs in the exon region. Os09g0510500 also has nonsynonymous SNPs at positions 19,814,779 and 19,814,916, and it has synonymous SNPs at positions 19,813,673, 19,814,118 and 19,814,262. However, Os09g0510500 (Hap1 and Hap2) has non-synonymous SNP, but there was no statistical significance. In contrast, the candidate gene Os04g0413500 showing statistical significance was involved in two groups (Hap1 and Hap2). The average 1000-grain weight of Hap1 and Hap2 was 27.01 g and 25.47 g, respectively (Fig. 6). So far as results, the SNPs and InDels are expected to be useful for future rice genome studies. Xu et al. (2012) found 6.5 million SNPs in 50 rice accessions. Arai-Kichise et al. (2011) had the following results of 132,462 SNPs, 16,448 insertions, and 19,318 deletions fragments with a mapping rate of 89.7%. Total 11,632,676 SNPs from 295 rice accessions were approximately 1.8 times more than those found by Xu et al. (2012) and 88 times more than those found by Arai-Kichise et al. (2011). For InDel, 1,285,506 InDels were approximately 36 times more than those found by Arai-Kichise et al. (2011). The false discovery rate (FDR) adjusted P-values of the SNPs selected as candidate genes are far higher than the commonly set, but there is statistical significance at 0.05, 0.01 and 0.001 probability levels, respectively. Because GWAS is one of the exploratory methods to find out associated or related genes with traits, we considered not only the adjusted P-value but also other factors such as stringent criterion of P-value, linkage disequilibrium and functional annotation. We set the significance level, α to 10 −5 – 10 −4 that are 500 – 5000 times higher than the commonly set (P-value < 0.05). Generally, SNPs associated to a trait are clustered together by linkage disequilibrium. Such cases are easily observed in the Manhattan plot, and the SNPs are frequently surrounded by SNPs with low P-values. Actually, FDR values can be variously determined depending on the purpose of research. According to Korte and Farlow (2013), it is important to consider whether to use high or low FDR values depending on the study purpose. Recently, FDR values (0.006 – 0.906) were used to identify genes related to the psoriasis skin disease pathway (Zhao et al. 2011a), FDR values (0.44 – 0.67) for paratuberculosis (Sallam et al. 2017), and FDR (0.17, 0.2) for GWAS simulation for Atherosclerosis Risk in Communities (ARIC) (Shi et al. 2011). We newly identified 15 candidate genes within ± 10 Kbp based on the significantly associated SNPs. Among those candidate genes, both Os01g0315700 and Os03g0604566 were identified in the whole core set, and Os05g0216950 in the KB accessions. Also, Os03g0604566 affects seed length in a previous GWAS (Huang et al. 2012) suggesting that it affect the seed length and the seed weight consequently. Acyl-CoA synthetase is known to affect maturation, fatty acid and lipid content of rice seed (Ichihara et al. 2003; Lee and Koh 2011). It was supported by GWAS that the candidate gene, Os09g0488000 (Acyl-CoA N-acyltransferase domain containing protein) affect seed weight of rice, but there is no significantly phenotypic difference in the haplotypes of the gene by subsequent haplotype study. In particular, Gao et al. (2015) revealed that the GS3 gene related to seed size and the qGL3 gene related to seed length affect the NB-ARC domain containing protein. The candidate gene, Os05g0216950 (NB-ARC domain containing proteins) having the same function, will be affected by GS3. However, there was no significant difference in 1000-grain weight between HS accessions and KB accession, even though they had non-synonymous SNPs in the exon part of the candidate genes Os01g0342800, Os01g0342900, Os01g0343001, Os03g0604700, Os04g0420500, Os04g0420600, Os09g0420600, Os09g0488000 and Os11g0488000. The 14 candidate genes except for Os03g0604566 were identified in a new position. The function of those genes may be different from grain weight, length, thickness and width (twg, gw, GS3, GW2, qGT4 and qGL6). Given that the whole genome length of rice is 400 – 430Mbp (Sasaki and Burr 2000), the range of ± 1Mbp from a significant SNP can be considered too wide to find the causal genes in GWAS. However, the LD block may be spread over 1 Mbp in some cases (Ueda et al. 2015). We were able to discover the Os04g0413500 and Os09g0510500 by extending the search region for candidate gene discovery to ± 1 Mbp. It has been reported that OsO4g0413500 (cell-wall invertase, controls carbon partitioning during early grain filling) and Os09g0510500 (basic helix-loop-helix (bHLH) transcriptional activator, controls leaf angle and seed size). The candidate genes, Os04g0413500 and Os09g0510500, are involved in seed formation by affecting its seed morphology and longevity by GIF (Weng et al. 2008; Ikeda et al. 2013) and Os09g0510500 by OsBUL1 (Jang 2017). Physiological factors, such as mineral content in rice plants, affect both growth and 1000-grain weight. Zhang et al. (2004) reported that the content of iron, zinc, manganese and phosphorus, affects the weight, length and thickness of seeds, and it is highly inherited. On the contrary, McDonald et al. (2008) reported that rice yielding increased as decreasing zinc content of grains. Thus, GWAS analysis of the physiological factors associated with 1000-grain weight will also be of interest. GWAS not requiring a RIL or NIL is used to find genes involved in the trait using a large amount of rice genome information. So GWAS is advantageous to shorten the breeding time and to search for various and complex genetic variation in rice (Zhao et al. 2011b; Korte and Farlow 2013). In conclusion, this study performed GWAS and haplotype analysis of 295 rice accessions using their resequencing data to identify candidate genes associated with 1000-grain weight. As a result, the statistically significant candidate genes, Os01g0315700, Os03g0604566, Os04g0413500 and Os05g021650, associated with 1000-grain weight were identified, which are expected to be served as basic data for development of molecular markers and breeding of new varieties for high yield. This work was supported by Korea Institute of Planning and Evaluation for Technology in Food, Agriculture, Forestry (IPET) through High Value-added Food Technology Development Program, funded by Ministry of Agriculture, Food and Rural Affairs (MAFRA) (115011-03-3-HD020), the BioGreen 21 Program (No. PJ013405) granted by the Rural Development Administration, Republic of Korea, and the National Research Foundation of Korea (NRF-2017R1A2B3011208) granted by the Korea government (MSIT). Fig. 1. Manhattan plot of genome wide association scan for 1000-grain weight in 295 accessions and candidate genes near peak of SNPs are shown along the top (A). Q-Q Plot (B). Fig. 2. Manhattan plot of genome wide association scan for 1000-grain weight in heuristic-set 137 accessions and candidate genes almost near peak SNPs are shown along the top (A). Q-Q Plot (B). Fig. 3. Manhattan plot of genome wide association scan for 1000-grain weight in Korean-bred line 158 accessions and candidate genes almost near peak SNPs are shown along the top (A). Q-Q Plot (B). Fig. 4. The characters of Haplotypes on chromosome 3 coding regions in 295 varieties. (A) Os01g0315700. (B) Os03g0604566. ** and *** indicate significant at the 0.01 and 0.001 probability levels, respectively. Fig. 5. The characters of Haplotypes of Os05g0216950 on chromosome 5 coding regions in 158 varieties. *** indicates significant at the 0.001 probability level. Fig. 6. The characters of Haplotypes of Os04g0413500 on chromosome 4 coding regions in 295 varieties. *** indicates significant at the 0.001 probability level. SNP and InDel numbers in the re-sequenced rice genomes. KB: Korean-bred line 158 accessions. Average of 1000-grain weight in 295 rice accessions. indicates significant at the 0.001 probability level. SNP position on high peaks associated with 1000-grain weight by GWAS results in each population. The loci and description of significantly associated signals of 1000-grain weight in 295 rice accessions. HS: Heuristic set 137 accessions. Arai-Kichise, Y, Shiwa, Y, Nagasaki, H, Ebana, K, Yoshikawa, H, and Yano, M (2011). Discovery of genome-wide DNA polymorphisms in a landrace cultivar of japonica rice by whole-genome sequencing. Plant Cell Physiol. 52, 274-282. Chen, W, Wang, W, Peng, M, Gong, L, Gao, Y, and Wan, J (2016). Comparative and parallel genome-wide association studies for metabolic and agronomic traits in cereals. Nat Commun. 7, 12767. Cho, YG, Kang, HJ, Lee, JS, Lee, YT, Lim, SJ, and Gauch, H (2007). Identification of quantitative trait loci in rice for yield, yield components, and agronomic traits across years and locations. Crop Sci. 47, 2403-2417. Doganlar, S, Frary, A, and Tanksley, S (2000). The genetic basis of seed-weight variation: tomato as a model system. Theor Appl Genet. 100, 1267-1273. Fan, C, Xing, Y, Mao, H, Lu, T, Han, B, and Xu, C (2006). GS3, a major QTL for grain length and weight and minor QTL for grain width and thickness in rice, encodes a putative transmembrane protein. Theor Appl Genet. 112, 1164-1171. Feng, Y, Lu, Q, Zhai, R, Zhang, M, Xu, Q, and Yang, Y (2016). Genome wide association mapping for grain shape traits in indica rice. Planta. 244, 819-830. Gao, X, Zhang, X, Lan, H, Huang, J, Wang, J, and Zhang, H (2015). The additive effects of GS3 and qGL3 on rice grain length regulation revealed by genetic and transcriptome comparisons. BMC Plant Biol. 15, 156. Huang, X, Sang, T, Zhao, Q, Feng, Q, Zhao, Y, and Li, C (2010). Genome-wide association studies of 14 agronomic traits in rice landraces. Nat Genet. 42, 961-967. Huang, X, Zhao, Y, Li, C, Wang, A, Zhao, Q, and Li, W (2012). Genome-wide association study of flowering time and grain yield traits in a worldwide collection of rice germplasm. Nat Genet. 44, 32-39. Ichihara, Ki, Kobayashi, N, and Saito, K (2003). Lipid synthesis and acyl-CoA synthetase in developing rice seeds. Lipids. 38, 881-884. Ikeda, M, Miura, K, Aya, K, Kitano, H, and Matsuoka, M (2013). Genes offering the potential for designing yield-related traits in rice. Curr Opin Plant Biol. 16, 213-220.
International Rice Genome Sequencing Project (IRGSP) (2005). The map-based sequence of the rice genome. Nature. 436, 793-800. Ishimaru, K (2003). Identification of a locus increasing rice yield and physiological analysis of its function. Plant Physiol. 133, 1083-1090. Jang, S (2017). A novel trimeric complex in plant cells that contributes to the lamina inclination of rice. Plant Signal Behav. 12, e1274482. Kim, KW, Chung, HK, Cho, GT, Ma, KH, Chandrabalan, D, and Gwag, JG (2007). PowerCore: a program applying the advanced M strategy with a heuristic search for establishing core sets. Bioinformatics. 23, 2155-2162. Kim, TH, Hur, YJ, Oh, SH, Lee, JY, Cho, JH, and Han, SI (2016a). Analysis of growth characteristics and yield components according to rice varieties between on irrigated and partially irrigated rice paddy field. Korean J Crop Sci. 61, 17-24. Kim, TS, He, Q, Kim, KW, Yoon, MY, Ra, WH, and Li, FP (2016b). Genome-wide resequencing of KRICE_CORE reveals their potential for future breeding, as well as functional and evolutionary studies in the post-genomic era. BMC Genomics. 17, 408. Korte, A, and Farlow, A (2013). The advantages and limitations of trait analysis with GWAS: a review. Plant Methods. 9, 29. Lee, CK, Kwon, YU, Lee, JE, Seo, JH, Shin, JC, and Lee, BW (2009). Effect of sink and source related characteristics on grain weight and grain nitrogen content in rice. Korean J Crop Sci. 54, 45-54. Lee, J, and Koh, HJ (2011). A label-free quantitative shotgun proteomics analysis of rice grain development. Proteome Sci. 9, 61. Lee, SB, Kim, KW, Yoon, MY, Kim, GJ, Yoo, JH, and Kim, WI (2016). Genome-wide association study on cadmium contents of temperate Japonica varieties. Korean J Breed Sci. 48, 470-485. Lipka, AE, Tian, F, Wang, Q, Peiffer, J, Li, M, and Bradbury, PJ (2012). GAPIT: genome association and prediction integrated tool. Bioinformatics. 28, 2397-2399. McDonald, G, Genc, Y, and Graham, R (2008). 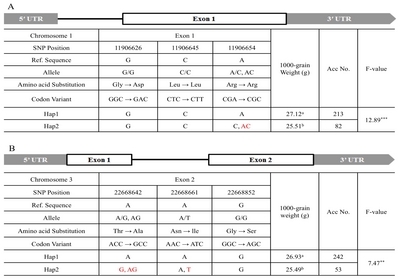 A simple method to evaluate genetic variation in grain zinc concentration by correcting for differences in grain yield. Plant Soil. 306, 49-55. Sallam, AM, Zare, Y, Alpay, F, Shook, GE, Collins, MT, and Alsheikh, S (2017). An across-breed genome wide association analysis of susceptibility to paratuberculosis in dairy cattle. J Dairy Res. 84, 61-67. Sasaki, T, and Burr, B (2000). International Rice Genome Sequencing Project: the effort to completely sequence the rice genome. Curr Opin Plant Biol. 3, 138-142. Shan, JX, Zhu, MZ, Shi, M, Gao, JP, and Lin, HX (2009). Fine mapping and candidate gene analysis of spd6, responsible for small panicle and dwarfness in wild rice (Oryza rufipogon Griff.). Theor Appl Genet. 119, 827-836. Shi, G, Boerwinkle, E, Morrison, AC, Gu, CC, Chakravarti, A, and Rao, D (2011). Mining gold dust under the genome wide significance level: a two-stage approach to analysis of GWAS. Genet Epidemiol. 35, 111-118. Shim, KC, Kang, JW, Lee, HS, and Ahn, SN (2016). Elucidating the genetic basis of grain traits in japonica rice cultivar ‘Daeribbyeo 1’. Korean J Breed Sci. 48, 276-285. Si, L, Chen, J, Huang, X, Gong, H, Luo, J, and Hou, Q (2015). OsSPL13 controls grain size in cultivated rice. Nat Genet. 47, 447-456. Tae, HN (2003). Inheritance of grain weight and size of a high yielding japonica cultivar, Sobibyeo. Korean JCrop Sci. 48, 142-146. Ueda, Y, Frimpong, F, Qi, Y, Matthus, E, Wu, L, and Höller, S (2015). Genetic dissection of ozone tolerance in rice (Oryza sativa L.) by a genome-wide association study. J Exp Bot. 66, 293-306. Wang, XQ, Yoon, MY, He, Q, Kim, TS, Tong, W, and Choi, BW (2015). Natural variations in OsγTMT contribute to diversity of the α-tocopherol content in rice. Mol Genet Genomics. 290, 2121-2135. Weng, J, Gu, S, Wan, X, Gao, H, Guo, T, and Su, N (2008). Isolation and initial characterization of GW5, a major QTL associated with rice grain width and weight. Cell Res. 18, 1199-1209. Xiao, J, Li, J, Yuan, L, and Tanksley, SD (1995). Dominance is the major genetic basis of heterosis in rice as revealed by QTL analysis using molecular markers. Genetics. 140, 745-754. Xu, X, Liu, X, Ge, S, Jensen, JD, Hu, F, and Li, X (2012). Resequencing 50 accessions of cultivated and wild rice yields markers for identifying agronomically important genes. Nat Biotechnol. 30, 105-111. Yang, W, Guo, Z, Huang, C, Duan, L, Chen, G, and Jiang, N (2014). Combining high-throughput phenotyping and genome-wide association studies to reveal natural genetic variation in rice. Nat Commun. 5, 5087. Zhang, MW, Guo, B, and Peng, ZM (2004). Genetic effects on Fe, Zn, Mn and P contents in Indica black pericarp rice and their genetic correlations with grain characteristics. Euphytica. 135, 315-323. Zhao, J, Gupta, S, Seielstad, M, Liu, J, and Thalamuthu, A (2011a). 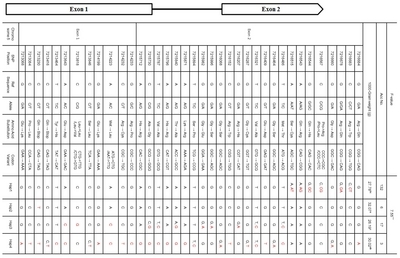 Pathway-based analysis using reduced gene subsets in genome-wide association studies. BMC Bioinformatics. 12, 17. Zhao, K, Tung, CW, Eizenga, GC, Wright, MH, Ali, ML, and Price, AH (2011b). Genome-wide association mapping reveals a rich genetic architecture of complex traits in Oryza sativa. Nat Commun. 2, 467.